Certainly, compared to the 15 years we’ve lived in Fethiye, the winter weather this year has been unprecedented. It’s been rain, snow (on the mountains), thunder storms and freezing temperatures. The rain has been pretty much daily and just as the weather forecast for Fethiye looks set to improve, we look again the day after and it’s all change. Back to the rain. And, as if all of that wasn’t enough, sand and dust from the Sahara was blown across the Med last week. Fethiye, and other Turkish Mediterranean and southern Aegean towns like Bodrum were left cloaked in a grey hue for most of the day…until the latest storm rocked up and cleared the air, drenching us in the process as we walked back from town. Back in 2010, we had storms that wreaked havoc in Çalış and Ölüdeniz. And this year has seen similar scenes where the beach has been washed up onto the promenade by the force of the sea. This year, the belediye (council) were really on the ball and were along the beach the day after for the clean up operation – numerous heavy duty cleaning contraptions that soon had the beach returned to its rightful place – back on the beach. This isn’t a ‘woe is us, our weather is awful when it should be sunny’ moan. It would be remiss of us not to mention the weather in this post, not just because of how Fethiye has been affected. In fact, we’ve got away with it quite lightly compared to our neighbours in the Antalya Province. Two tornadoes have hit the Antalya area this month, killing two people and injuring others. Damage to agricultural zones and also the airport where the second tornado smashed steps into a parked plane, knocking a hole in its side. As I type, we’ve had heavy rain and booming thunder through the night. A grey start to the day with low, distant rumbles and more rain falling. No surprises for us, then – and probably everyone else in this corner of Turkey – that the Turkish General Directorate of Meteorology put out the above tweet on the final day of January. Highest rainfall of the last 24 hours was recorded in Antalya and Fethiye. Fingers and toes crossed for a more settled February, eh. For quite some time on the blog, we’ve had a selection of jigsaws that we’ve shared intermittently. For 2019, we’ve decided we’re going to create more of these on a regular basis. We have had the odd sunny day throughout January (maybe two or three?) and the beautiful Çalış morning you can see above – the day after the post storm clean up operation – inspired our first jigsaw of 2019. We’ve since shared one more, too. If you don’t follow us on Facebook, you may well have missed these weekend Turkey-themed jigsaws. If that’s the case and you’re feeling the urge to procrastinate, feel free to have a go at our latest jigsaw and / or any of the others, of course. It being January and the traditional month where you try to hunker down and save a bit of cash, eating out hasn’t really been on the agenda this month. However, a bit of a break from the norm for us with this offering. January was the month where one of our favourite restaurants, Denizatı Restaurant, launched their weekly Sunday roast. I can’t say we’re particularly ‘Sunday roast’ people. Our Turkish food diet also seems to have rendered many of the traditional British meals rather heavy on the stomach. And, if we’re being perfectly honest, display fridges and menus in restaurants tend to offer more temptation for us. However, the very occasional big fat plate of fish and chips at Charcoal Palace is irresistible, and, as for the Denizatı Sunday lunch, lamb is one of the offerings so we thought we’d partake in the launch day. Barry’s mum ordered the whole chicken breast and loved it. Denizatı’s homemade bread served with olives and herby village butter – and a steaming bowl of homemade soup of the day (mushroom, in our case). Main meal is a choice of beef, lamb or chicken served with homemade Yorkshire pudding, broccoli, braised red cabbage, roasted carrots and potatoes. Gravy is served in a separate gravy boat so you can add as much or as little as you like. Dessert is homemade apple pie served with both custard and ice cream. As you can see, beautifully presented with a little extra strawberry treat. The Sunday roast is by reservation only and you tell them which meat you would like when your reserve your table. You can do this by messaging them on the Denizatı Facebook page or just go into the restaurant if you’re in the area and passing. Whilst we haven’t eaten there this month – proper little hermits we are at the moment – we did tell you about the all-new Meri Bar in Çalış on the blog in January. Their food is proper tasty pub food and means you can now while away a good chunk of time in the bar without having to leave to get some solids inside you. We’ve also been continuing with updating and tidying up around the blog, too. Over New Year, we walked from Fethiye to Kayaköy and then from Kayaköy to Ölüdeniz. 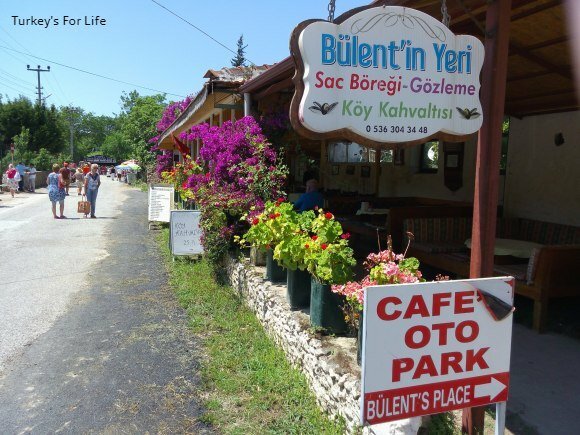 That required our usual pitstop of beer and gözleme at the cheerful Bülent’in Yeri. Only fitting, then, that our article got the tidy up treatment and some new photos to bring us right up to date. It’s a special, but no-nonsense, place. It deserved the update. As for our Turkish recipes, as well as new dishes being added, we are also continuing to bring our existing recipes right up to date. Because we’ve been home a lot recently, that’s meant lots of cooking. And because the weather’s been so miserable, much homemade soup has simmered on the hob. It’s broccoli season so our potato and broccoli soup recipe got an update – and we made it, too, of course. 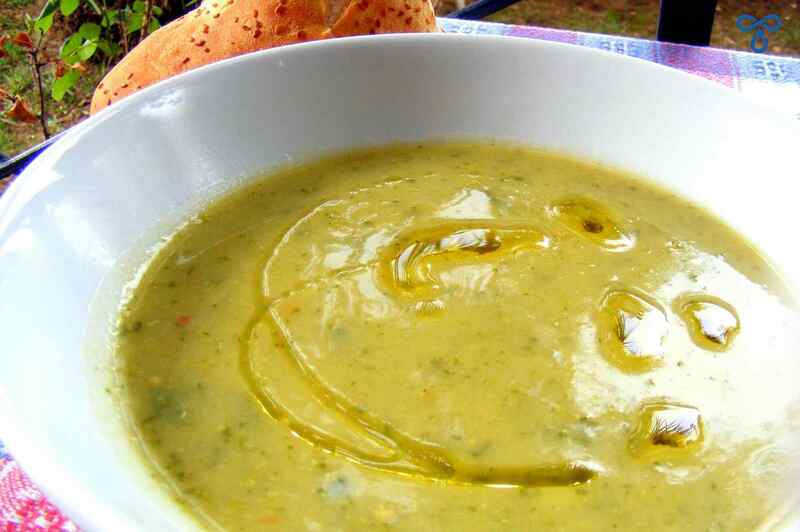 And when you’re in the mood for soup, you also need to make yummy Turkish spicy lentil soup, too. You then eat it with copious amounts of bread! Obviously, over the space of a month, we’ve made lots of other treats. If you follow us on Instagram, you’ll see some of these creations on our Instagram Stories. Chicken schnitzel and guacamole have been regulars – but we’ve also made lots of other dishes that are not on the blog…yet. All in good time. 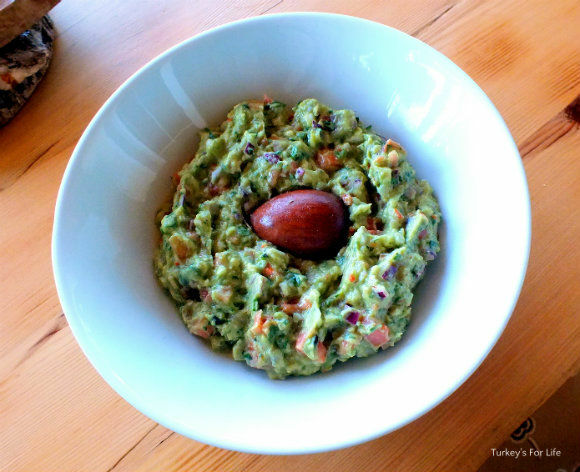 The reason for so much guacamole is because local avocados are in season at the moment and local seasonal eating is what we’re all about. And we just love guacamole, too. Are we going to survive in League 2 this season or are we going to be getting our first experience of League 3 football next season? The latter is looking the more likely at the moment sadly. We’re yet to see Fethiyespor play in 2019, despite them being three matches into the second half of the season. 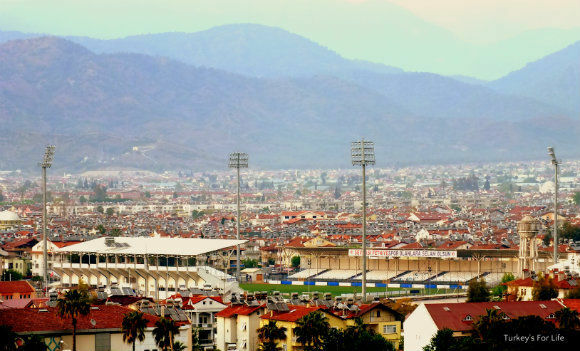 Only one of those matches has been at home and it was decided that home match would be played in Muğla. It was decided by us that, with the weather as it is, a journey to the higher, colder lands of Muğla wasn’t really too appealing. We learned that lesson when we trooped off to Izmir to watch Fethiyespor play Karşıyaka a few years ago. So, we very sensibly stayed at home. Fethiyespor lost. Here’s the league table for you. In the last away match, we were 2-0 up. Lost 3-2! The next home match is February 3rd at 1:30pm, if you can bring yourself to watch. And if you’re in town anytime soon and fancy coming along to a game, here’s the rest of the fixtures. At the beginning of the month, we had icy temperatures. And, on the day this photo was taken, we had a sea level Real Feel temperature of -7. The snow did look stunning and it seems everyone who hit the ‘like’ button thought so, too. And that just about rounds off January. It’s been all about the weather. And, as it’s tippling down right now, why don’t we leave you with some suggestions for surviving Fethiye in the rain? Definitely ‘Bring on February ‘.